Great location, and everything well organized for us. After I understood the addresses, get the key was easy. Excellent location. Small, but cozy atmosphere, enough space for two. Nice stuff. Would stay again. The apartment is nice and clean, very modern and well equipped. Location and proximity to Esplanade Park. There are supermarkets nearby. Sijainti loistava. Ei ollut pitkä matka Nosturiin keikalle. Ja kauppa ihan nurkan takana. Отличное расположение: в центре, 10 минут пешком до рыночной площади или до вокзала. Магазин в соседнем доме. Удобно оплачивать проживание картой в кафе напротив. Там же получили подробные инструкции, где найти апартаменты. Хороший вариант для того, чтобы остановиться на одну, две ночи для осмотра Хельсинки. Очень уютно , чисто , есть все необходимое и рядом с центром . 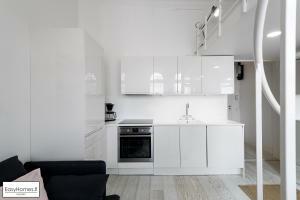 Lock in a great price for EasyHomes Helsinki Erottaja 1 – rated 8.2 by recent guests! EasyHomes Helsinki Erottaja 1 This rating is a reflection of how the property compares to the industry standard when it comes to price, facilities and services available. It's based on a self-evaluation by the property. Use this rating to help choose your stay! A 15-minute walk from Helsinki Music Centre, EasyHomes Helsinki Erottaja 1 is located in the Kaartinkaupunki district of Helsinki. This property is 0.8 miles from Helsinki Cathedral and has free WiFi. The apartment includes 1 bedroom, a bathroom with free toiletries, a living room and a kitchenette with a dishwasher. A TV is provided. Finlandia Hall is a 17-minute walk from EasyHomes Helsinki Erottaja 1, while Helsinki Bus Terminal is 0.9 miles away. The nearest airport is Vantaa Airport, 12 miles from the accommodation. 뀐 Located in the top-rated area in Helsinki, this property has an excellent location score of 9.3! When would you like to stay at EasyHomes Helsinki Erottaja 1? Area Info – This neighborhood is a great choice for travelers interested in design, food and friendly locals – Check location Excellent location – show map Guests loved walking around the neighborhood! House Rules EasyHomes Helsinki Erottaja 1 takes special requests – add in the next step! EasyHomes Helsinki Erottaja 1 accepts these cards and reserves the right to temporarily hold an amount prior to arrival. If you expect to arrive outside of check-in hours, please note that EasyHomes Helsinki may charge EUR 5 for late check-in. All requests for late arrival are subject to confirmation by the property. Please inform EasyHomes Helsinki Erottaja 1 of your expected arrival time in advance. You can use the Special Requests box when booking, or contact the property directly using the contact details in your confirmation. The building was renovating, so pictures were not updated. Also, the workers would start working 8 am, making impossible to sleep after that. Would be great to have some information about it, as it was annoying. The Windows were taped off and covered as the outside was replastered. Work starts at 8:00. This will last till spring 2019 The appartment is poorly equiped and poorly laid out. No table to sit on, bad Lighting, only 2 pans, strugle with the shower doors when brushing you teeth. Also it wa not well cleaned, We found hairs here and threre. The bed is on a platform where you can’t stand up and the space gets very hot - no airco, only a noisy fan. The windows were taped shut and blinded because of construction work; it felt like being in an aquarium. I was repeatedly requested for my arrival time and when I arrived at the arranged hour the room was not ready (for 30 mins). The apartment looks modern but is very impractical. Not value for money. Its central location is the best feature. The staff. I have requested for later timing checkout vis booking.com . It is fine if the request was not agreed. However as I received a response through booking.com that my request was received and “ Erottaja Homes said checkout at 3-4pm” in the notification. However when we returned to the apt at 3.05 pm, we were shocked that our unlocked big luggage with cash was placed outside the apt. Apparently they claimed that they tried to contact me. But there was no missed calls at all. Besides they should have my number as i queried how to use the dishwasher earlier through whatsapp. The staff cited the late checkout was not approved hence they proceeded to remove our luggage and stuff from the apt. This was different from what was received from booking.com’s response. Apparently the fault lies with booking.com as claimed. Outer walls of the house have been repairing. So it wasn't possible to open the windows because of the smell. It was no AC and it was extremely stuffily at night. See so-called "city view" on my picture. The host was very kind to let us early check-in. Collecting the keys after 7.00pm costs an extra 40 EUR. Basically meaning that the price doubles. There is info that check-in is only until 7.00pm, but no info about this extra cost. I find this a little bit of a rip-off. Especially nowadays when you can just invest in a Master-Lock system and give the code to the person picking up the key whenever it is necessary.